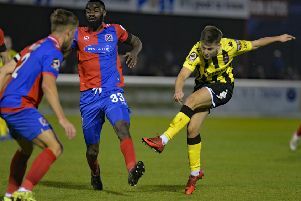 AFC Fylde manager Dave Challinor praised the impact of returning duo Henry Jones and James Hardy following their cameo roles against Eastleigh. Jones had been sidelined by injury since November and Hardy since October, and both made long-awaited comebacks at Mill Farm on Saturday. Both claimed an assist in an entertaining 2-2 draw, while Jones also netted a late equaliser. And Challinor was delighted to have his attacking stars back in action. Challinor said: “We want a fully fit squad to pick from and we have had to be patient with the two of them. “They are very good players and we want them available, whether that’s starting or coming off the bench to make an impact. To have them back is a big boost for everyone. “They had shown signs of getting back to their best in training and Saturday was a good game for them to come back in. “I knew that we would have opportunities to get into little pockets of space and that is perfect for James and Henry. That is their game. “As Eastleigh started to tire towards the end, I knew the two of them would have an impact on the game. “We had plenty of chances to score before the substitutions without any joy, but thankfully the substitutes made a big difference when they came on. The Coasters enjoyed the lion’s share of goalscoring opportunities at the weekend against their south coast opponents, recording a phenomenal 45 crosses into the box. Fylde have had to settle for one point from their last two games, having claimed 19 from the previous 21. Challinor admits his side won’t always get their just deserts. He added: “Sometimes you get the result you deserve and sometimes you don’t. “I don’t think the last two performances have been a whole lot different to the previous games, when we were winning, but results haven’t followed. “We were really good on Saturday and didn’t get what we deserved. “We should have got at least a point at Woking but that’s part and parcel of football. “That could happen again more than once before the end the season, so we just have to keep plugging away and being positive. That continues this weekend away to Gateshead. “It helps that the league has settled down but we are in a good place at the moment, with an almost injury-free squad.